Home to the New Forest, the South Downs National Park, a stretch of the south coast and a county town that’s as historic as they come, Hampshire has something for everyone. No matter where you go in the county you’ll be just a stone’s throw from beautiful landscapes, interesting wildlife and opportunities for outdoor activity. In our book, that makes Hampshire camping an attractive prospect. It’s also slap-bang in the middle of the south coast making it easy to reach for many and within two hours’ drive of London. It’s hard to imagine a camping location that ticks the boxes for so many different types of camper. Perhaps that’s why there are so many incredible Hampshire camping and glamping sites! From rural campsites for families to hidden glamping getaways in the woods, discover the very best campsites near Andover in Hampshire with this hand-picked collection from Cool Camping. Form family-friendly campsites to cosy glamping retreats just for couples, discover the best places to sleep under canvas in Corhampton, Hampshire, with this hand-picked collection of truly special places from the experts at Cool Camping. 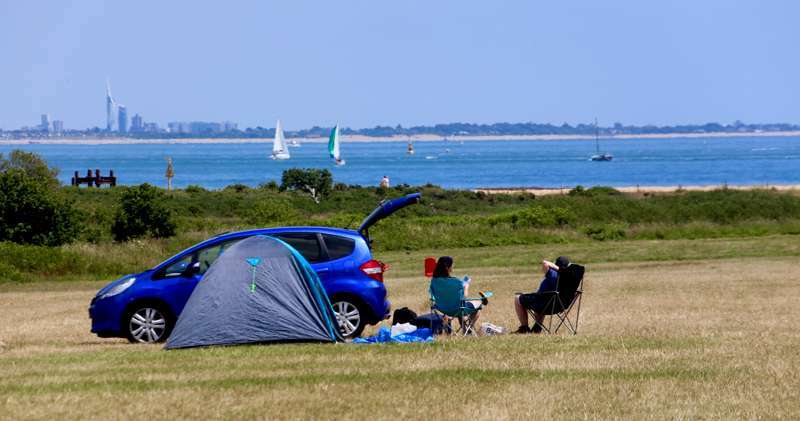 Whether it's walking the Hayling Billy coastal path, birdwatching over the mudflats north of the island or trying your hand at windsurfing on the beaches where it was invented, the south coast island of Hayling is an excellent location for a camping holiday. Find the best campsites nearby here. Whethe you're pitching the tent, parking up the campervan or even looking for a luxurious glamping site in which to stay, discover the best places to camp and glamp near Petersfield, Hampshire, with this hand-picked collection of exceptional campsites from the experts at Cool Camping. At the heart of England's south coast, the Hampshire city of Portsmouth is awash with maritime heritage and popular weekend attractions. We've been our uncovering the best campsites and glamping sites in the area, with a select short-list of our favourite places to stay. The compact city of Winchester, home to one of the largest cathedrals in Europe and pocketed with picturesque, nook-and-cranny streets, is a real attraction for anyone camping in Hampshire. Find the best places to pitch with our hand-picked collection of Winchester campsites. The scenery in Hampshire ranges from south coast beaches to the magical New Forest and the best campsites in Hampshire are just as varied. Here, in the middle of the south coast, is a place where you can choose a campsite by the beach or in the trees, on the South Downs or in the green Test Valley. You can pull up in a motorhome or pitch a two-man tent. You can book a shepherd’s hut or bring your own caravan. The camping and glamping scene in Hampshire is thriving which is good news for us campers as it means plenty of choice and high standards. In addition to its beautiful landscapes, which include parts of two national parks and several areas of outstanding natural beauty, Hampshire has plenty of places to visit on days out. Aside from walking, wildlife watching, and watersports; tourist attractions and towns compete for visitors’ attention. You can see the Mary Rose at Portsmouth’s Historic Dockyard, visit the famous cathedral in Winchester, take the kids to Peppa Pig World and hire bikes to explore New Forest villages. There’s more than enough to occupy families on a two-week summer holiday but Hampshire is also a great place for weekend away. Its location puts it within a two-hour journey time of much of the south, including London. With great rail and road connections, it’s little wonder that this area is a hotspot for camping in the south of England. The New Forest has been a playground in the south east since William the Conqueror arrived in 1066 and, soon after, declared it his royal hunting ground. Exploring the area on horseback is still a popular activity, but these days you’re more likely to see families and wildlife watchers than royal hunters. Nonetheless, they'll still have their sights set on the area’s resident deer and free-roaming pony population. The wildlife is one of the reasons that it’s a popular place for camping and a large majority of Hampshire’s campsites are concentrated in the national park. Classic campers are well catered for here – especially in the summer months when pop-up campsites add to the number of pitches available. Across the New Forest and the rest of Hampshire, there’s a full range of campsite types from basic sites in farmers’ fields to holiday park-style behemoths. Here at Cool Camping we tend to prefer the smaller places. Usually they are independently owned and often they are owner run which means you can expect more personal touches than professional sheen. But that doesn’t mean all the Hampshire campsites we’ve handpicked for our collection are the same. Whether you’re after somewhere to pitch a two-man tent or to park your family-sized motorhome, our range of campsites can deliver. Some are basic sites where the beauty is in keeping it simple and some are special for on-site facilities. Unsurprisingly there are sites within the trees of the New Forest itself but there are also campsites by the coast, up on the downs and in farmers’ fields too. The choice is no less vast when it comes to glamping in Hampshire. 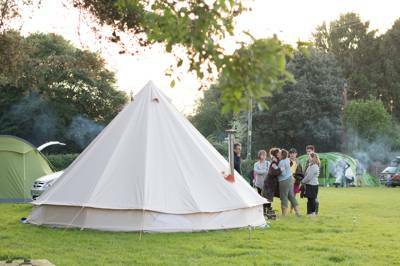 There are bell tents, tipis, yurts, safari tents, shepherd’s huts and treehouses. And, just like classic campers, glampers come with different ideas about what their luxury camping holiday should be like. You might be keen to get away on a camping holiday but reluctant to pitch your own tent – in which case a pre-erected bell tent or safari tent might be just what you’re looking for. 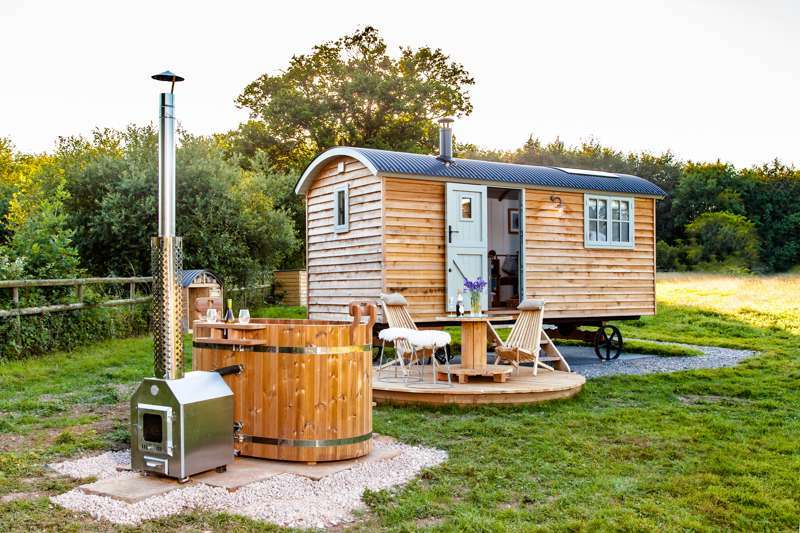 On the other hand, you might be hoping for somewhere further up the glam scale of camping; a shepherd’s hut with en-suite facilities, fluffy towels, even a hot tub. There are plenty of quirky glamping options too from modern geodesic domes to traditional log cabins and gypsy caravans. We know that camping and glamping can mean different things to different people and we try to cater for all tastes while we’re looking out for sites to feature in our range. What they all have in common is that they’ve been handpicked by our travel experts as special places to stay. If you are planning a family camping holiday, you couldn’t do much better than Hampshire. The county is choc-full of family-friendly attractions and activities which make days out easy to find. And then there’s the joy of camping itself. The sociable nature of campsite life means little playmates for your little ones are never far away. Choose a site with a car-free camping meadow and they can enjoy a relative freedom that they may not have at home. Playing outside all day, toasting marshmallows on the campfire and even getting to sleep in a sleeping bag are all added attractions and part of the adventure. If you’re camping as a family for the first time, you might like to ease in to it with a family glamping holiday – all the joy of camping without having to pitch a tent with toddlers (or teenagers) in tow! There are lots of campsites that have been specifically designed to be family-friendly too. 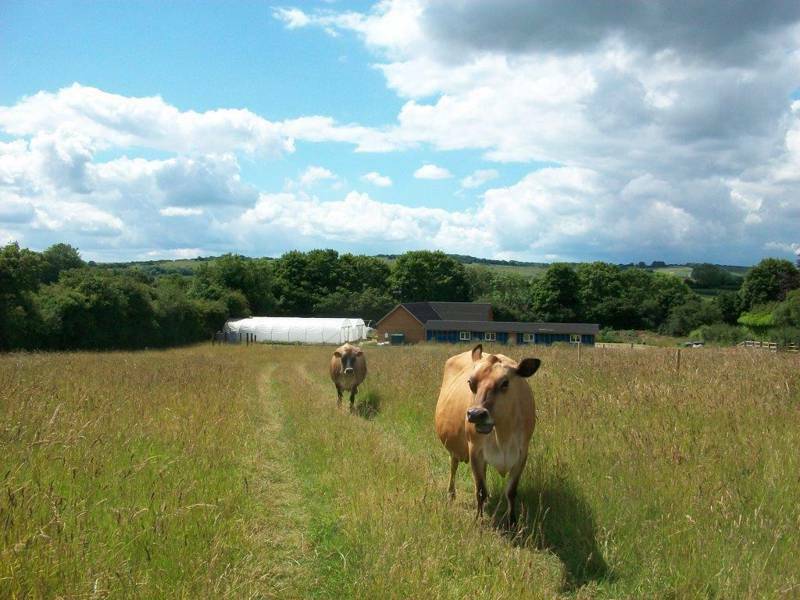 Look out for sites with activities and play equipment for children and if your children love animals, how about camping on a farm site? If they love swimming or watersports, head for those south coast campsites for a seaside holiday while teens and tree-climbers might be more at home in the New Forest where adventurous activities are all part of the fun. It’s not only kids who will be seduced by this beautiful part of the world. 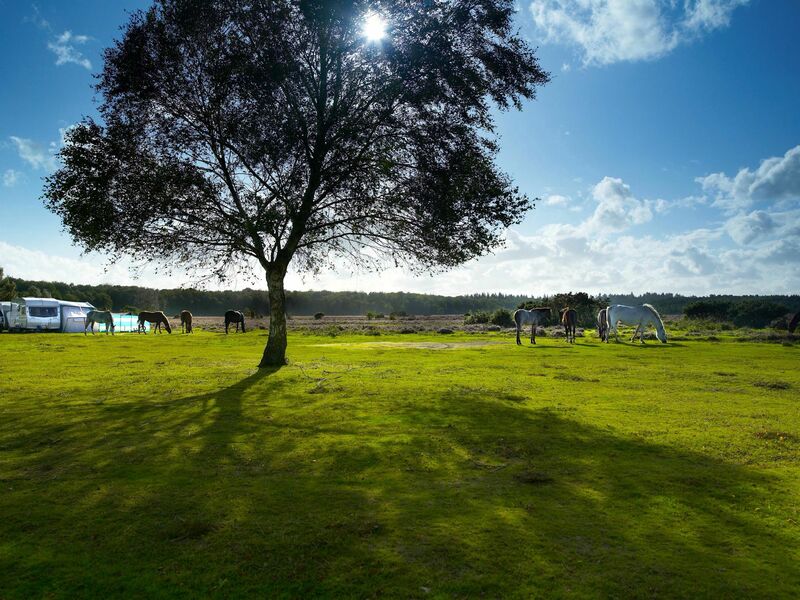 The other-worldly, unfenced land of the New Forest with its free-roaming ponies and herds of deer, is perfect for long, romantic walks. The start of the South Downs Way National Trail is in the county town of Winchester and there’s plenty to explore on the coast too. You can spend days on the water, discovering historic sites, cycling round the countryside and visiting age-old inns. The quaint towns and villages of the Test Valley in Hampshire’s north-west are a fascinating place to visit and usually quieter than the New Forest and the coast. Wherever you choose to explore in Hampshire, what could be more romantic than returning to a yurt or shepherd’s hut that’s warmed by a log burner? Or sitting by the campfire outside your tent under a starry-night sky? 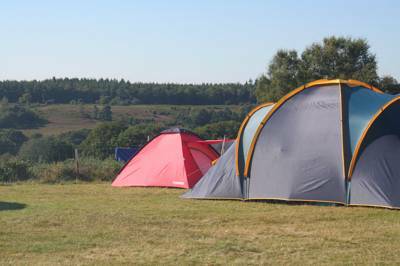 The school holidays and Bank Holiday weekends can be busy, particularly in the New Forest, so if you’re after a quiet adults-only break, our advice would be to try and book a camping holiday outside of peak times. Mid-week breaks tend to be particularly quiet and often better value too. There are some adults-only camping and glamping sites, but there are also places which have secluded pitches or solo glamping units with plenty of privacy and space. The New Forest is Hampshire’s biggest draw for campers and it’s where you’ll find the majority of the county’s campsites. A mixture of woodland and heathland, it was named and shaped by William the Conqueror. Almost a thousand years ago he set up a system of commoners’ rights, which meant people could graze livestock on the land. This system is still in place today and is why you see free-roaming ponies in the area. It has also created special habitats for wildlife that are part of the reason it was designated a national nature reserve in 1969 and a national park in 2005. It’s relatively easy to see a wide variety of birdlife and wildlife including red deer, roe deer and fallow deer. There’s lots of open-access land in the 220-square-mile park and hundreds of miles of footpaths and bridleways as well. About half of the land is managed by the Forestry Commission who have visitor sites with marked walking and cycling trails, picnic sites and information boards. There’s also a national park visitor centre in Lyndhurst, the largest village in the New Forest, which is a good place to pick up camping supplies too. Brockenhurst is another hub in the New Forest, where you can shop, eat and pick up public transport connections as it has a train station with direct links to London. Some of the best attractions in Hampshire can be found in The New Forest, including Paultons Park and the National Motor Museum at Beaulieu. The New Forest National Park stretches down to the coast where Lepe Country Park offers a combination of great countryside and sea views. Hampshire’s coastline overlooks the Isle of Wight and The Solent. You can take a ferry there from the mainland port towns of Southampton or Portsmouth. The Solent is a busy shipping channel but this stretch of sea is also a great place for sailing and watersports. In Portsmouth, you can visit the historic dockyard and just down the road at Gosport you’ll be able to take to the water on a sailing trip or try your hand at stand-up paddle boarding, kayaking, wind or kitesurfing. If you’ve got younger kids, there’s tamer, traditional seaside fun on Hayling Island . Connected to the mainland by a road bridge across the sea, Hayling Island offers all the fun of the fair and plenty of places for ice creams and fish and chips on the Blue Flag shingle beaches. In the east of the county is Hampshire’s second national park, the South Downs. It’s the youngest of England’s 10 national parks, having been designated in 2010, and stretches all the way across Sussex to Eastbourne. It’s one of the largest areas of chalk downland in southern England and the 600-square-mile national park includes more important habitats for wildlife and wildflowers. The 100-mile South Downs Way long-distance footpath across the park is a popular challenge which makes a great multi-day walk. It’s also popular with runners, mountain bikers and horseriders. It offers great views and a satisfying end point on the coast. 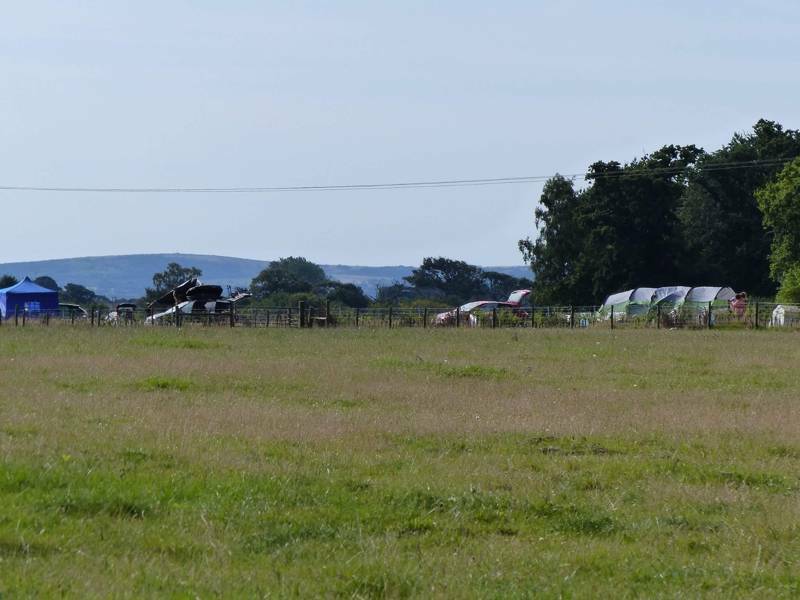 Naturally, camping near the South Downs National Park, gives you access to all these activities and there are lots of campsites and glamping sites close to the route and across the Downs. Historic Winchester sits at the park’s western tip. It’s cathedral stands at the centre of a jumble of pretty streets and ancient buildings which are now home to independent shops, boutiques and eateries. Within the park there are other pretty market towns and villages that make pleasant places to visit including Steep, Petersfield and Midhurst. There are historic houses and gardens in the area, including Goodwood, and family-friendly attractions include Marwell Zoo. This sometimes-overlooked area of Hampshire in the county’s west is worth a visit. The River Test is renowned for trout and fly fishing and if you visit one of the area’s market towns, Andover or Romsey, you’ll be able to try the area’s speciality, locally smoked trout. You can see the Tudor battleship, the Mary Rose, and Nelson’s Victory among the maritime treasures at Portsmouth Historic Dockyard. It’s this port city’s biggest attraction and great for all ages. The stretch of sea between the mainland and the Isle of Wight is famous for sailing and watersports so it’s the perfect place to take to the water. Expert or beginner, swimmer, sailor or SUP-er, this is a great place to dip your toes in. You know you’ve arrived in this protected park when you drive over a cattle grid and start seeing ponies among heathland and glimpses of deer in the woodland. If you love the great outdoors, it’s difficult not to love this place and, even if your Hampshire camping holiday isn’t in the New Forest, you should make time to visit it. New Forest campers will probably want to head to the village of Lyndhurst to fuel up or stock up. It’s also home to the New Forest Visitor Centre so worth the trip even if you’re only in the forest for a day. There’s a bit of everything at Beaulieu: a historic house, beautiful gardens, an old abbey and a motor museum. With indoor and outdoor activities, this makes a great rainy-day activity during a camping hoiday. Parents of young kids should prepare for a lot of snorting. Peppa Pig World is part of the larger Paultons Park where there are more than 70 rides and attractions which are suitable for all ages. You might not fancy heading in to the city on a camping holiday – but Winchester is a different sort of city. Picturesque, compact and a pleasure to walk around, it’s got a cathedral that’s been attracting pilgrims for a thousand years as well as medieval buildings and lots of independent shops and eateries. 9. The South Downs Way. Even if you don’t fancy stomping the full 100 miles along this national trail, it provides the best way to get up on the downs. It’s well signposted and takes you to the top of the chalk ridge that makes up the South Downs. Head for Hayling Island if you want traditional seaside fun while you’re camping in Hampshire. Amusements, ice cream, fish and chips and a fun fair crowd the south coast. It’s also said to be the place where windsurfing was invented. 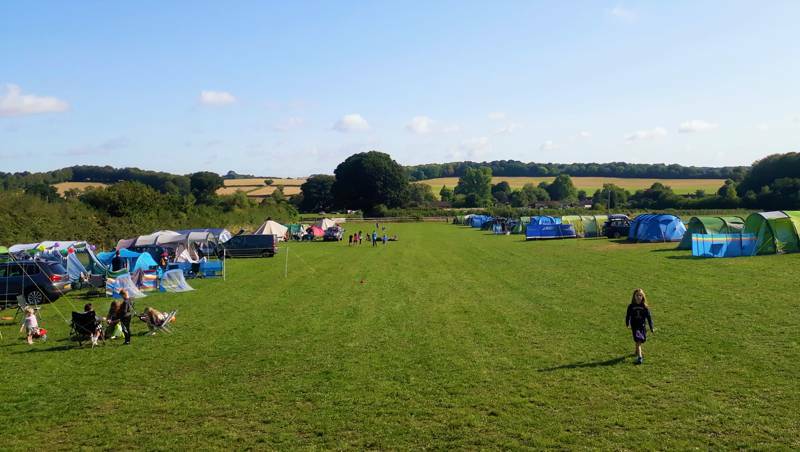 Hampshire at Campsites in Hampshire, Take a look at Cool Camping’s handpicked list of the best campsites in Hampshire and book your camping holiday in an instant. With campsites ranging from woodland camping and waterside sites to beachside campsites and romantic retreats, you won’t know which campsite to choose.